Viwawa is proud to be part of World Cyber Games, Singapore 2011. Viwawa Players can compete to be the best in Sushido, Stwack or Buffet Wars! There are 3 phases in this Tournament for each game. The first phase will involve players playing a certain number of random matches. Top players from this group will proceed to our knock out stage. The first 2 phases will be played ONLINE. The Top players from phase 2 will then compete in the finals of WCG SG 2011 from 9th - 11th September 2011 at Singapore Expo 1 (Details in individual instruction page). Do check out the Rules and Instructions for each game for more details! Exclusive WCG SG Wawa part for all participants. Each player is only allowed to compete in one tournament since the finals will take place all together! 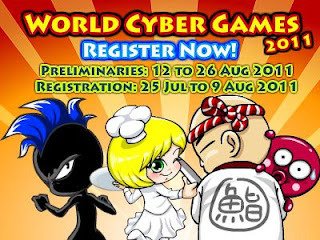 Please visit our World Cyber Games Singapore Finals 2011 site for more details.